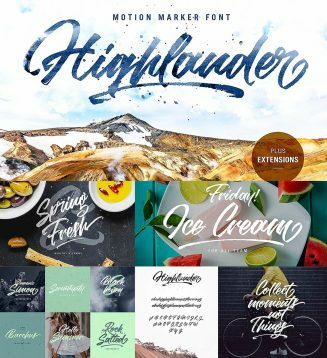 Highlander comes with a full set of upper and lower case characters – giving you the extra freedom to turn your text into authentic custom-made hand lettering. File format: .otf, .ttf, .woff, .woff2, .html, .ai, .eps for Photoshop or other software. Tags: branding, display font, handwriting, marker, script, typography.